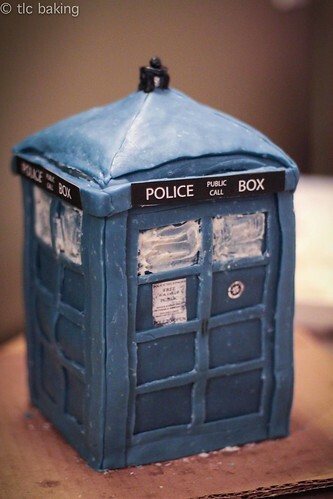 TARDIS cake – happy 50th! – tlc. | tender love and cupcakes. 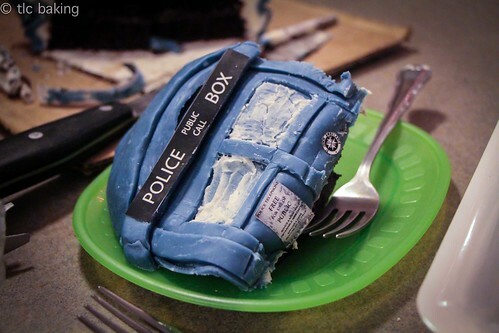 TARDIS cake – happy 50th! 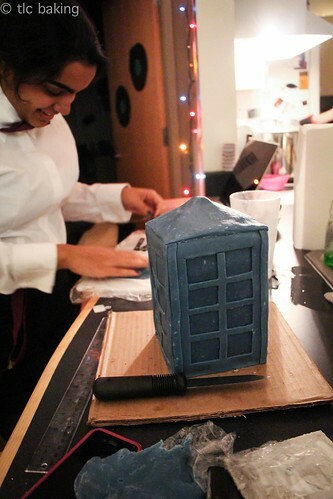 Let me preface this by saying that I have the coolest roommates ever. …and, of course, to actually watch the new episode and collectively freak out. 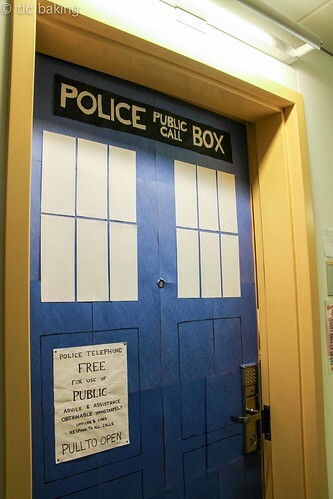 Kaitlyn, being the perfect person she is, used her artistic powers for good and turned our door into a TARDIS. What? 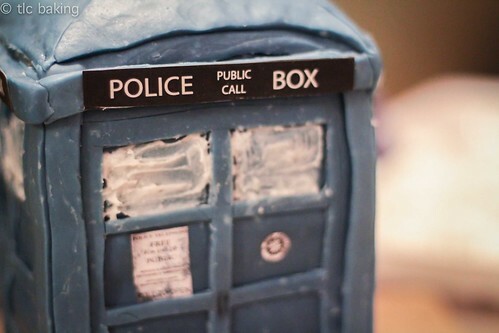 It’s bigger on the inside, you say? Sam, being the perfect person she is, sat through several episodes and a crash-course powerpoint presentation (courtesy of Phillips) so that she wouldn’t be lost during the party, and even dressed up as Sally Sparrow. Sadly, I don’t have a photo of this. 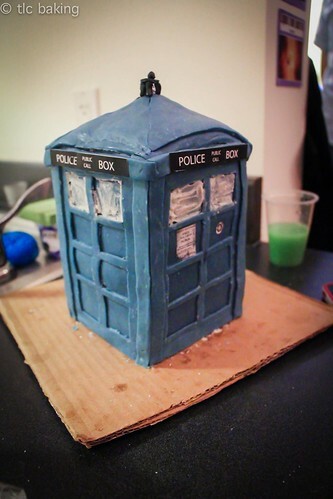 My contribution for the night was a TARDIS cake, inspired by this wonderful tutorial by the Artisan Cake Company. 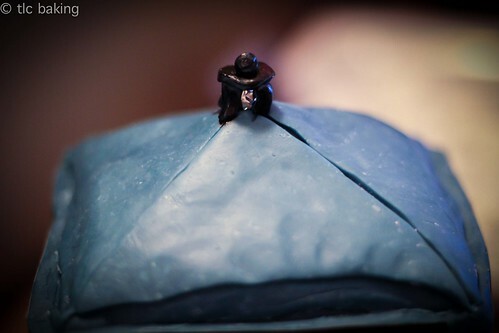 Of course, I’m terribly nitpicky, so it kills me to compare my cake to the tutorial. 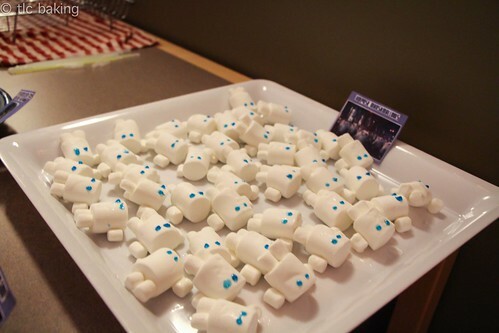 I’m already looking for an excuse to make another one and perfect the design. Probably a bad idea, considering how long this one took me, but I’m not going to think about that. 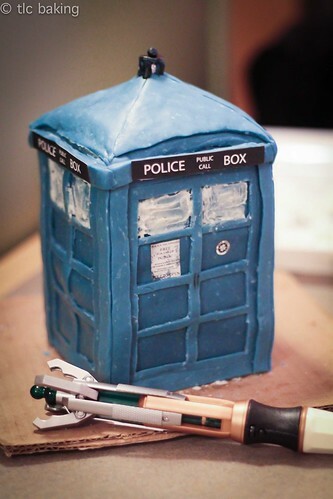 The cake–well–it was definitely the easiest part of the whole process. I used my go-to chocolate cake recipe from foodess. It’s darker than most chocolate cakes without being overwhelmingly rich, it’s moist, and it has a soft crumble that’s hard to stop eating. The modeling chocolate, made using this video’s recipe (also referenced by the tutorial), turned out way greasier than the instructions suggested it would. I ended up draining the excess water/grease as I mixed the corn syrup and melted chocolate. I was a little nervous that it would turn the chocolate into a crumbly mess (as threatened by the video), but after sitting wrapped up overnight, it was just as perfectly malleable as I’d hoped. Phew. Which prompts me to say: if you’re using Wilton candy melts, you’re going to end up with alarming amounts of liquid as you’re mixing. Don’t panic. Drain the excess, wrap the chocolate in plastic wrap, and go to sleep. It’ll be fine. Really. There are few situations I could’ve imagined in which I’d be molding a cake using a paring knife. This is what happens when there’s no way you can get your hands on an exacto knife. 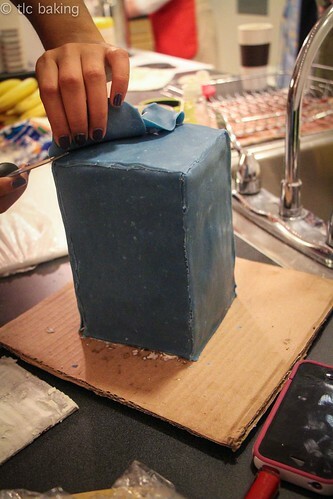 Several layers of modeling chocolate later, I had a vaguely shaped blue box. Hooray! 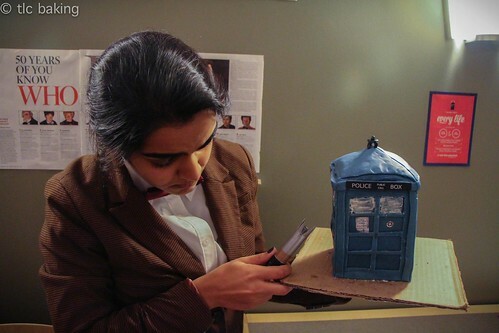 In the interest of keeping this cake as cheap as possible–and actually finishing it in time for the party, which was a struggle as it was–I passed on the white fondant and the intricate painting of windows, using leftover buttercream and a bit of black gel food coloring to finish the decorations. I also used a tiny balled up piece of aluminum foil instead of an actual floral light. I’m a college student; what am I supposed to do with an entire pack of floral lights? 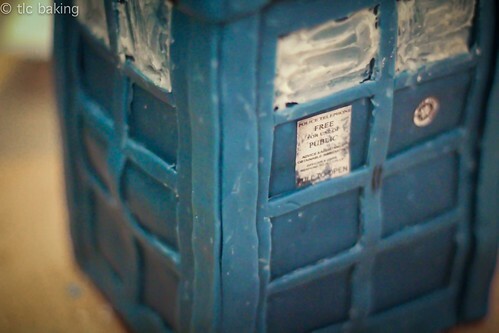 Topped that with leftover modeling chocolate painted black, and I had a “light” for my TARDIS. 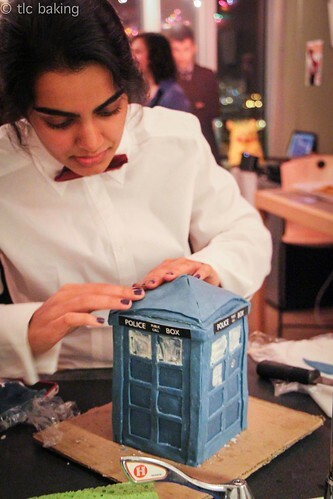 At some point during this process, I switched from apron-clad apartment baker to a femme eleventh Doctor putting the finishing touches on her precious ship. The suspenders and blazer showed up later. All in all, definitely a successful project. It was painful finally cutting into the cake–but also beyond worth it when everyone actually got to enjoy it. The support straws got sliced in the process and looked rather silly. Also dang, look at those slabs of modeling chocolate. 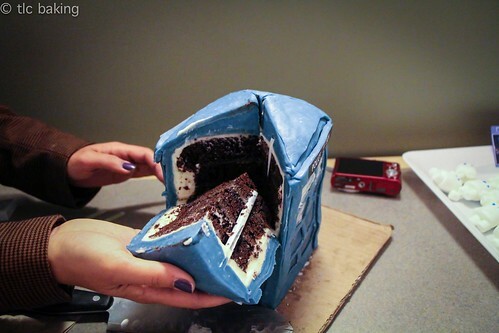 I didn’t even realize how much frosting and chocolate had been layered on there until I cut the thing open. Overall: 10/10, would definitely try something this out there again. Too much fun! For progress photos & many more detail shots, head over to my flickr. Most of these are courtesy of Kaitlyn, who is responsible for the majority of the party documentation. Next time, we’ll return to our regularly scheduled programming that includes far less time-consuming recipes.